If you know me well, then you know I have a bit of an obsession with cookware. Recently I acquired a new pot like no other pot in my kitchen; it's a stove top and oven safe ceramic pot by Emil Henry. You read the title, but it's not a tagine. It's a 5.5 quart stewpot. I've wanted something like this for a long time. I have some very nice Le Creuset which are wonderful enameled cast iron pots, but this pot is like having a crock pot for the stove or oven with the advantage of being able to brown ingredients over higher heat. The vessel is the perfect size for soups and stews (I guess that's why they call it a stewpot.) It doesn't heat quite as evenly as cast iron, but the heat retention is considerably better than cast iron. I actually think this makes for better stews. 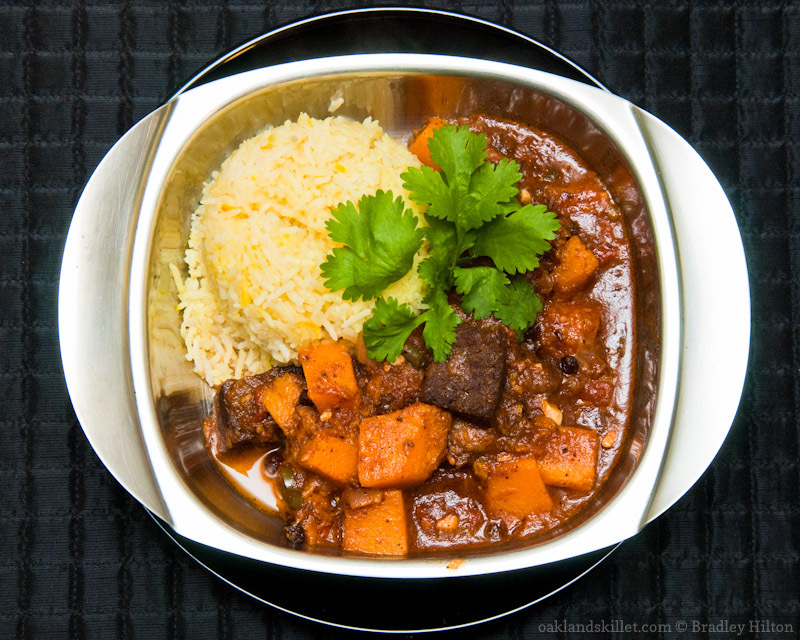 This pot is a terrific alternative to the Moroccan Tagine. While I think the Tagine is a beautiful and very unique piece of cookware its utility is fairly limited. My new ceramic pot serves the same purpose as the tagine with more versatility. It is inevitable that I will someday acquire a tagine (maybe when I build my wood fired pizza oven), but for now I can't think of a disadvantage to this pot. I've never made a stew in this style, so I wasn't sure my first attempt would end up worthy of an Oakland Skillet post. I should have had more faith in my skills and intuition. I based my recipe on two recipes I found on the internet. The first recipe is by Jamie Oliver and the second was published in Cooking Light. Neither of these recipes were exactly what I was looking for. The second recipe from Cooking Light suggests this can be done in 45 minutes which is preposterous. If you make this in 45 minutes, as the recipe suggests, the meat will be way too tough and chewy. Long cooking time at a low heat is the only way to make these inexpensive cuts of meat tender. Jamie's technique is of course right on, but I didn't have some of the ingredients his recipe called for and I wanted something a little richer. My recipe uses more spices and a richer stock. My first attempt at a Moroccan style dish could not have turned out better. Combine the dry spices and grind in a spice grinder or mortar and pestle. Add the meat and spices to a bowl. Rub the spice mixture all over the meat, cover and refrigerate for 8 - 12 hours. Remove meat from refrigerator 30 minutes before cooking. Preheat a tagine or large pot with a tight fitting lid over medium heat. If using a real terracotta tagine be careful not to set the heat too high and be sure it is suitable for stove top use. Add the olive oil to the hot pan. Brown the meat on all sides. Work in batches so as not to over crowd the pan. When all of the meat has been browned add all of the meat back to the pan. Add the onions, garlic, and Serrano chilli. Saute until onions become translucent, about 8 minutes. Add the crushed tomatoes and saute for 5 minutes more. Add the beef stock. Cover the pot and simmer for 1 1/2 - 2 hours or until the meat is very tender, but not completely falling apart. Stirring occasionally. Add the squash and currants and continue to simmer for 30 - 45 minutes longer or until the squash is very tender and the meat is falling apart. If the liquid is too thin remove the cover and keep the pot at a simmer and reduce to desired thickness. Start the rice shortly after adding the squash. Serve the stew with a scoop of saffron rice and garnish with cilantro. Notes: I made this with Beef. Next time I'm going to try Lamb shoulder. You do not need a tagine or even a ceramic pot to make this recipe. Any pot with a tight fitting lid will work. In fact this could be made in a crock pot, but you'll have to brown the meat in something else first then transfer everything to the crock pot to finish cooking. Use San Marzano tomatoes if possible, they really are the best canned tomatoes.